Our primary venue is Archon, a general SF & F convention, and its Grand Masquerade. Other local venues we frequented (both are now unfortunately defunct) included NameThatCon and Gateway. Archon's Grand Masque is the biggest competition in the Midwest and one of the best in the United States. You can't get much better tech then these guys and the audience is appreciatively loud. Typically three-fifths of the show is made up of our members. We do travel outside the immediate area, frequently attending Costume-Con and occasionally Worldcon. And since our members live in many states and countries, we show up just about everywhere at a wide variety of conventions or gatherings. Costume-Con is a 4-day conference devoted just to costuming; it includes workshops, seminars, discussion panels, and multiple masquerades. 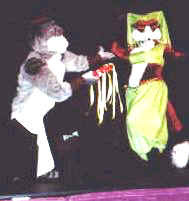 It travels to different cities every year; we hosted CostumeCon 16 in 1998. 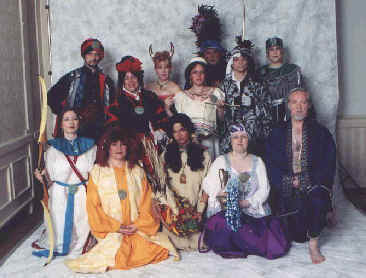 One of two International level competitions (the other is Worldcon) Costume-Con draws entries from as far away as England and Australia but has three different masquerades; Science-Fiction & Fantasy, Historical, and the Future Fashion Design & Show. Costumes here are evaluated on two distinct and separate levels: Workmanship and Presentation.